The State Opposition has opened up the chequebook, pledging to renovate two of Cardinia Shire’s “neglected” schools in a $9.5 million investment, if elected. 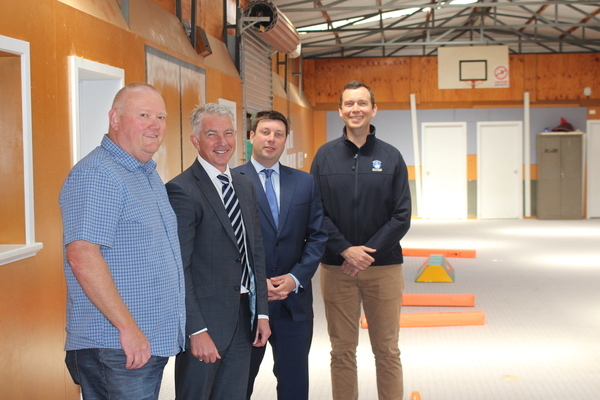 Pakenham Secondary College would receive a $7 million major facelift while Kooweerup Primary would receive a state-of-the-art, $2.5 million gymnasium. It comes just a week after the Gazette reported that the Kooweerup School’s dilapidated gymnasium was serving as a “zoo” for snakes, lizards, rats and mice. 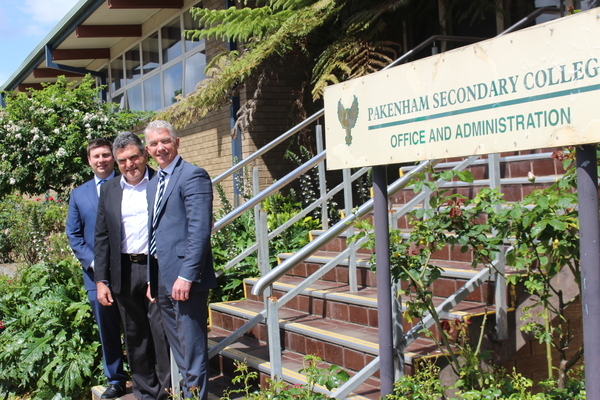 Shadow Education Minister Tim Smith toured Pakenham High and Kooweerup Primary on Wednesday – shocked by how much both had been “ignored” by the State Government. “Daniel Andrews talks about the education state, but that slogan clearly doesn’t apply to these schools,” he said. “As you can see, the kids are doing gym in a tin shed and I can only imagine in the middle of summer or the height of winter, it would be stinking hot or freezing cold. “It looks like something you keep farm machinery in – and that is totally unacceptable. “At Pakenham High, the $7 million will be well spent. Under the proposed Pakenham High upgrades, the school’s asbestos-riddled administration building and Year 7 centre would be completely demolished and replaced with modern developments. The master plan will also include an amphitheatre, new internal roadways and parking. Bass MP Brian Paynter said both schools are in dire need of financial support. “They are absolutely desperate for this,” he said. “At Pakenham Secondary College, the buildings are old and lack functions that we need in modern day schools, and aesthetically, the school could use a lift. “It has a prominent road frontage and the buildings don’t do it justice. “In that room at Kooweerup, you could barely fit 20 kids in there. On Wednesday, Premier Daniel Andrews travelled to Pakenham to spruik an $850 million cash splash for new schools across Victoria. The party detailed the next steps preceding the opening of Pakenham Primary School and Pakenham Henry Road Secondary.Meanwhile, Mr Paynter said it was important to look after existing schools. “It’s okay to build new facilities but it shouldn’t be at the expense of our existing schools,” he said. The Pakenham Secondary College upgrade has reportedly been on the school council’s radar for more than eight years. College vice principal Emmanuel Merambeliotis is hopeful that the commitment will come to fruition. “The main need to upgrade what is essentially a 40 year old building is so we can deliver quality teaching and student outcomes,” he said. “It has certainly held us back – from the smaller staffroom, through to some of our issues with the building, from roof to guttering and floorboards.